Me: "How far did you get with the rules?" Me: "Yeah, but how 'much' of them?" Evie: "I read the whole book." Wow! I was really impressed. The No Thank You Evil boxed set comes with three adventures, but since our family had already played the first two, Evie wanted to run the third: The Curse of Adventure Kingdom. I'll admit, I was a little nervous for Evie. Not only was this her first time GM'ing, but it this was an adventure designed for experienced players. I shouldn't have been worried! 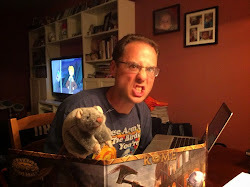 How many nine year olds out there have spent bennies in Savage Worlds, slung cyphers in Numenera, and lamented at the loss of so many characters in Dungeon Crawl Classics? Cooper played "Stampy," the Fast Robot who Eats Ice Cream accompanied by Fluffy the Robot Dog. Carrie was "Lizzy Lizbeth," the Super Smart Wizard who Plays Video Games, joined by Izzy the Invisible Friend. Jen (Mommy) went with "Austin," the Fantastic Spy who Bashes Evil, along with her Fast Car Tracy. I had to reprise my playtest role of "Delivery Boy," the Cool Super Hero who Loves Pizza, with his ever-faithful Tiny T-Rex named Toppins. As we shared in our unboxing video, there are a lot of great game pieces found in the boxed set that make gameplay very fast and extraordinarily fun. Spending points from pools is as easy as tossing a point of Tough or another of Awesome into the middle of the table. New GM's get a lot of support when running No Thank You Evil. Not only are the monsters often included with "show 'em" type cards, the adventures are written in a format that helps the GM craft the story and guide the players. Examples of possible solutions are clear, as is guidance for when players want to do something out of the ordinary. At one point I wanted to climb the side of a ferris wheel rather than ride it, and Evie informed me that the climb would be incredibly difficult, suggesting I should just ride. I asked her why she had that idea, and she pointed to the exact language in the adventure. Evie already has plans for running No Thank You Evil again, both in our house, but also at an upcoming Norwin Game Knights event. I believe the game has sparked a fire in this little kiddo's imagination. I can't wait to see her come up with some of her very own original ideas!